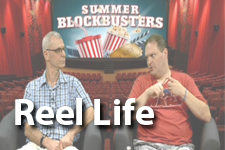 ​Reel Life delves into all genres of Hollywood films, offering commentary, analysis and fun-facts along the way. The show is hosted by Mike Wigdor and movie buff Frank Mandosa. AIRS: Mondays at 10:30am, Tuesdays at 4pm, Fridays at 8pm, Saturdays at 7pm. WATCH NOW: Click here to watch Reel Life on demand.